I read. A LOT! Those that know me well are rolling their eyes right now! Lol! I own a Kindle (a lovely gift from the husband!) and that works great for trips and to always have a book available. However, I love reading actual books, with pages I can turn, so I can skip ahead and read the endings!! Yes, I do that. Because of my addiction, I visit my local library weekly. I could never afford to buy the amount of books I can devour in a week’s time, so borrowing is the best! Every once in a while, I find a bookmark or a receipt or note left in a book and I thought wouldn’t it be fun to leave behind a bookmark for the next person to use? I can never seem to find one when I need it and have been known to use toilet paper. I know, a little TMI, but there you have it. I had some watercolor postcards in my supplies and when they were cut in half, they made a great size for a bookmark. I added some random watercolor splashes all over the paper with my fabulous water brush (affiliate link…because I think everyone should own one of these!!) and let them dry. The bookmarks curled up a bit, so I left them overnight under a heavy book. Over the next few days, I doodled over the watercolors whenever I was watching TV, using both a extra fine tip and a fine tip black marker. I didn’t have any plans, just did whatever came to mind. It was a great stress reliever! 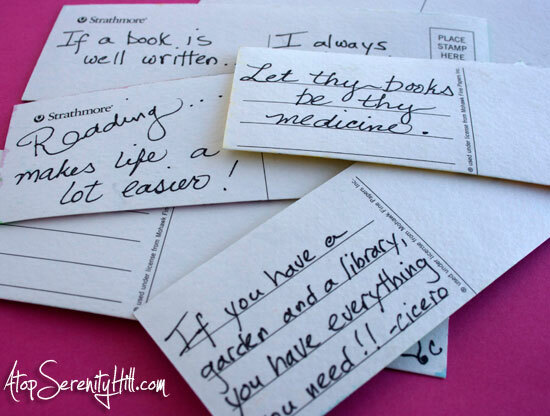 On the back of the bookmarks, I added a few sayings I found online. These aren’t perfect or neat. Just a fun surprise for the next person to enjoy when they dive into a book! I have been adding them to the books I’m returning and hope they bring a smile to someone face. Thanks, Liz! I really enjoyed doing them and it is always nice to give someone a surprise! These look so pretty! 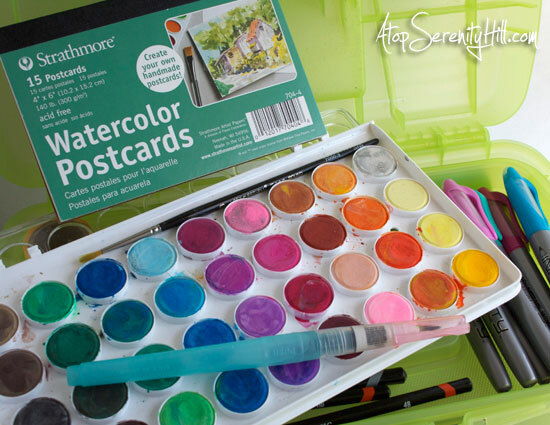 I”m going to have to try these with some watercolor paper that I have. Pinned! Thanks, Emily! 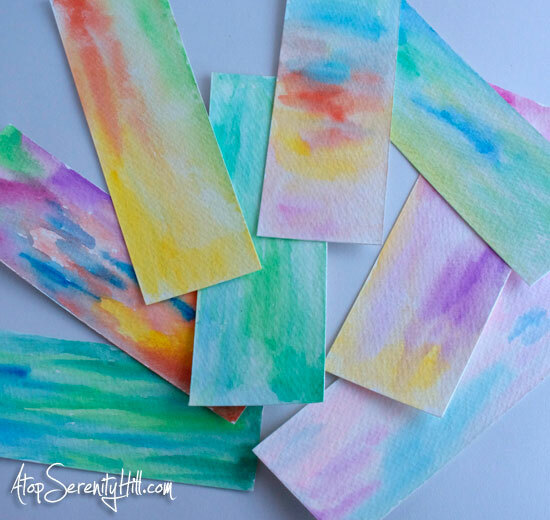 So easy and fun to do…enjoy! What a wonderful idea, so generous. I use my hankies sometimes. I buy most of my books at the thrift store in town close to us for between 25cents to 50cents. I have quite a library so when I can’t go buy a book I dig out one I read awhile ago and reread it. Some I’ve read about 3 to 4 times if not more. I have several by my favorite authors so it’s handy. The hard part is being able to get to them. Hubs has buried them in the shed. HE complains about my books all the time. I love your book markers, you are so talented at doodling, it’s incredible. Hope your enjoy the holiday weekend. 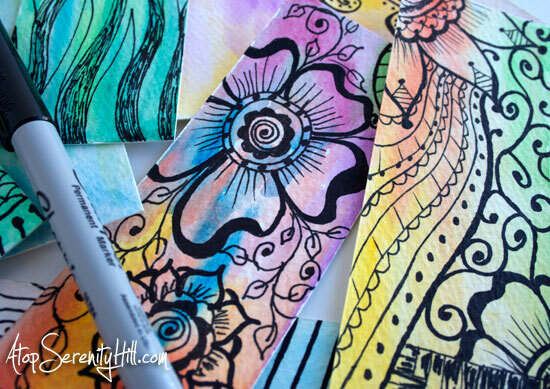 I love your doodle bookmarks! Thanks, Virginia! I am enjoying doing them! 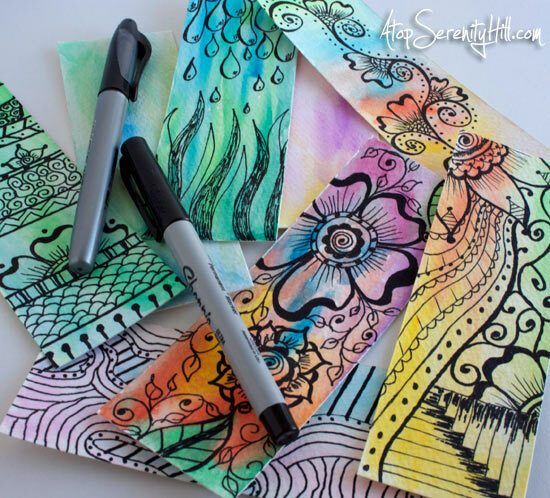 Love these doodle bookmarks. I always enjoy seeing your art and creative ideas. This is so cute! My daughter would love this for a weekend activity! Thanks, Shannah! Your comment gave me an idea! My library has a special event for kids and this might be a fun project for them! I wish my doodles were as beautiful as yours!! This is a great project, made all the more fantastic by your artistic abilities! Thanks, Antonella! Doodling is all about practice! Just keep on doing it and you can only get better! Will certainly stop by. So cute! I’m always doodling. You could easily make that into some artwork! Thanks, Becca! I am hoping to work on some art for an etsy store at some point. The colors are beautiful, and the intesity of the black really pops. Super cute doodles! Thanks, Kristy! They are fun to do! Love the idea of making some and leaving them in library books! I love checking out books from the library, and like you love it when I find a receipt, bookmark, or some other tid bit from someone’s life…thanks for the great idea! Also, you are a fantastic artist. Beautiful work! Thanks, Kate! Finding all that stuff in books myself is what gave me the idea. I like finding the checkout receipt to see what other books might be fun to read! Have a great day. Thanks, Kayla! I’ll check out the giveaway. What a great idea! Love the idea of a pay it forward, especially for book lovers. Love your bookmarks by the way. Thanks, Bev! Have a great night. I love these so much I just HAD to feature it today on Planned in Pencil, feel free to grab a button if you’d like! Thanks, PJ! That was very sweet and always appreciated! Thanks, Elena! Your new party is a great idea! Here’s hoping I can be in the top 3! Have a lovely weekend. Consie, you are on a roll! Thanks again!! Have a wonderful week. I like these Consie!! I love the doodling, but if I try to doodle, it doesn’t look like this! I love this idea SO much. Your bookmarks came out super cute, and I know the people who found them were pleasantly surprised. Very fun. Thanks, Tracie! Too bad I can’t put a hidden camera on the bookmarks so I can see the reactions! These bookmarks are cute and thoughtful. They make me smile so I’m sure the person who finds one will do so as well. Thanks, Teresa. I hope they brighten someone’s day! These are beautiful and such a neat idea. I’d be thrilled to find one in a book! Thanks, Al! I enjoy making them…a little stress relief for me! These turned out incredible!I love your “doodles”. Consie, Your bookmarks are beautiful and I would be delighted to be a lucky discoverer! Very nice abandonment! Thanks so much, Raisa! I hope your class enjoys them!